I wrote this devotional for my Ladies Auxiliary class in the first part of December. I thought it appropriate to share now. My hairdresser is truly a magician. I stand in awe of her many talents and in the safety and comfort of her confessional chair, I confided a struggle I've had for a while. She shared the story of her One Word New Year's Resolution. She had heard a speaker talk about having one word, a personal mantra, as a resolution, rather than a self-defeating list of things no one ever accomplishes. She thought about it, prayed about it, and chose the word "control." Whether it was controlling her spending or giving up control of a problem, control fit her life needs at that moment. She found herself looking up scriptures that dealt with control and used them for inspiration and encouragement. Focusing on that one word gave her a place to start a positive change in her life. Little did she know, she was an instrument of the Lord that day. It was exactly what I needed to hear, exactly when I needed to hear it. As I sat there, I thought of my word and shared it with her. It's a word I'd been working with for about six months at that time. I didn't know what I was doing at that time or have any specific directions on how to use it, but I reflected on it and referred back to it when I needed a pep-talk. My word is "enough." It fits many situations, like having had enough or having done enough. I've begun my exploration of that word and its various meanings and connotations. Adequate, sufficient, and full are synonyms for enough. I'm searching the scriptures for these words and how I can apply them to my personal needs. In Exodus, God told Moses, "I am that I am..." I am...enough. I am...whatever you need. I am...the only thing that can fill that empty spot. I am...the One who knows your heart of hearts. I am...the One who loves you in spite of everything you do. 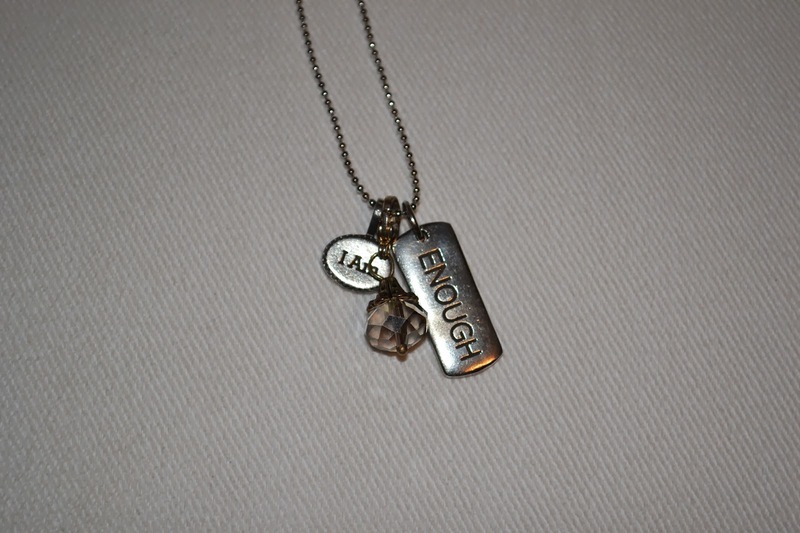 Angie gifted me with a charm necklace that says, "I am enough." In realizing the infinite scope of who God is, I'm learning the scope of who I am in Him...and that I am enough. No matter what I'm told. No matter how I'm made to feel. No matter what I do or what I don't do. I am enough...just like I am. I'm still not convinced. I'm not quite there yet, but I'm working on it every day by challenging as well as setting limits for myself. So, I'm sharing my word, which is deeply personal to me, in order to encourage you to find your word. Everyone has a word. January is coming up and I think I'm going to keep my word for another year. It's very easy to get started. Pray about it. Scripture tells us in Psalm 19:14, "Let the words of my mouth, and the meditation of my heart, be acceptable in they sight, O LORD, my strength, and my redeemer." Ask for guidance in finding the area you need to address. Choose the word that is revealed to you. You'll know it immediately. Search the scriptures. What has the Lord said about your word? Apply the principles you find to your life. Use it for daily meditation, memorization, signs around your house, share it as a testimonial. 1 Timothy 4:15 tells us, "Meditate upon these things: give thyself wholly to them; that thy profiting my appear to all." The whole goal is for others to see our word, His Word in us.